25 Days after the v2.0 I am pleased to announce the v3.0 of Git Diff Margin! 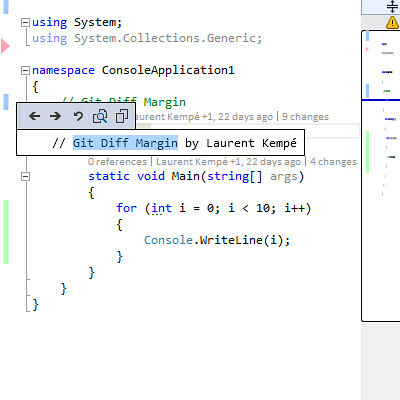 Git Diff Margin displays live Git changes of the currently edited file on Visual Studio margin and scroll bar. Thanks to the great work of Sam Harwell Git Diff Margin v3.0 now support Visual Studio 2010, 2012, 2013 and Visual Studio 14 “CTP”.